Ever wanted to attend an Austin City Limits taping but were foiled by time, distance or not winning the ticket lottery? Well fret no more — we’re thrilled to announce our first-ever live stream of an ACL taping, this coming Friday, November 4, 2011 at 9:00 pm ET. We invite you — beautiful people of the Internet — to join us this Friday night as we embrace technology and bring you Lykke Li live from our new home, ACL Live at The Moody Theater. If you haven’t caught a show in our new state-of-the-art venue this is the perfect time to tune in and check it out — there’s only one other taping after this show. 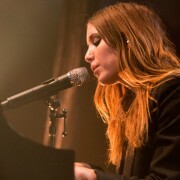 Our friends at PBS will be hosting an exclusive live stream of indie songstress Lykke Li’s entire Austin City Limits taping, all just a click away. To watch the performance and join the conversation simply visit the PBS’s Facebook page here and press play. We’ll be chatting it up on Twitter to bring you the full ACL experience and some extra behind-the-scenes commentary live during the evening. If you’re not following us already be sure to do so @acltv. Also, if you want to share the videos and photos we’ll be taking during the show be sure to head over to our Facebook page.